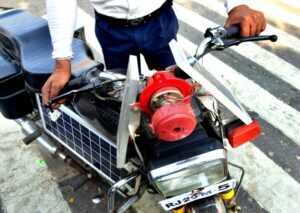 Jaipur: Ever thought, what it would be like if the brakes, shocker, wind and a solar panel could give energy to your motorbike along with petrol. Add another 40 percent fuel efficiency to that and lesser emission by the same percentage? Sounds like a dream. Right? But what if, it’s a reality? Meet Indraj Gurjar, a Jaipur-based policeman, who has converted his Hero Honda CD 100 into this dream mean bike. His modified bike gives 125 kilometers mileage. Indraj is a senior secondary pass out. Neither is he a mechanic nor a mechanical engineer, but one thing that he has is – a passion for making innovations. “Since childhood, I used to modify articles. As now most bikes don’t give much mileage and the demerit of electric bikes and rickshaw is that, while running when its power reduced, it needs to stand and then again recharge. This realization made me design this hybrid bike, where we can use other renewable sources of energy to improve its mileage and keep running,” Indraj told eNewsroom. 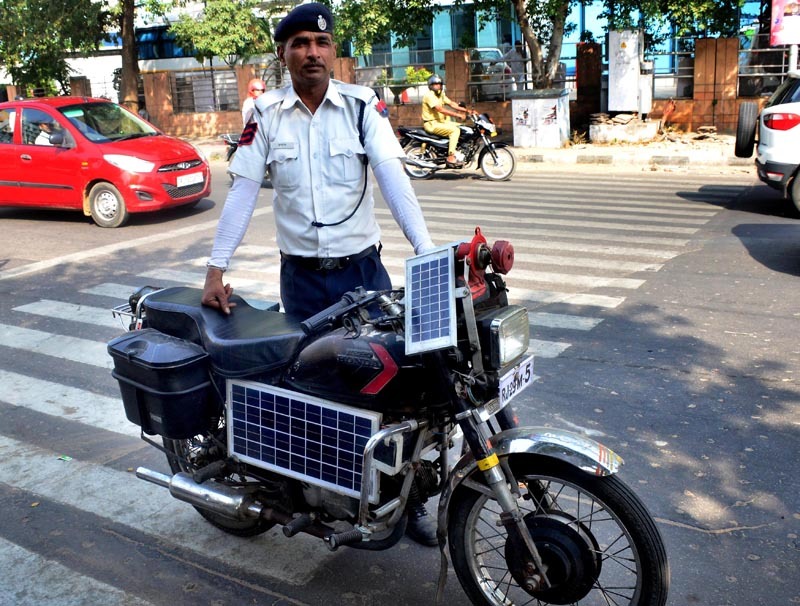 His bike has a solar panel mounted on it to utilise the solar energy. He has also tweaked his bike design to use the wind energy to boost the fuel efficiency. “Post redesigning, my Hero Honda CD 100 gives a mileage of 125 kms per liter. The RPM (rotation per minute) of my bike’s engine is now 25 percent less,” informed the 47-year-old policeman. He claimed that now, anybody can come, check and see what changes he has made to the bike for better efficiency. With that efficiency he had travelled to Gujarat on the bike. “You bring any bike to me and I will make it give 40 percent more mileage and emit 40 percent less,” Indraj added. Interestingly, his helmet too had solar panels, but unfortunately it got broken. Indraj, is not a one time innovator, he has also designed an anti-theft lock for four wheelers and has won a cash prize of Rs. 1,00,000 few years back. “The lock can be put anywhere in the car or inside any four wheeler. And when its on, the vehicle can not move an inch,” he claimed. Elaborating on how he won the prize for the lock, Indraj said, “There were several engineers and scientists in the competition who examined my innovation meticulously. They even tried to determine if the lock was emitting radiations that could harm humans. However, the anti-theft lock passed all test, and I won the first prize.” Indraj had made a video of it and has been running it on Youtube channel. But, even after appreciation from several people for his extra-ordinary works, he is yet to get support from Rajasthan Police or government. “My senior officers maintain that the department has no provision to support his work and politicians do not get back after making empty promising,” rued the self made inventor. 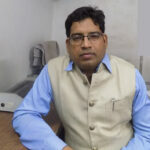 The traffic policeman looks after VIP movements in the state capital, but Indraj asserts that he has several ideas in mind and can make several invention, if supported.